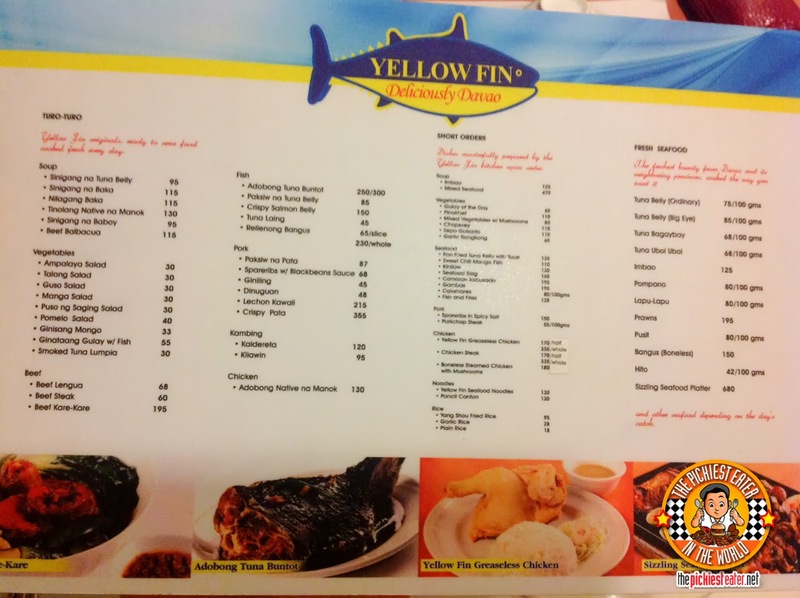 THE PICKIEST EATER IN THE WORLD: YELLOW FIN SEAFOOD & RESTAURANT: DELICIOUSLY DAVAO! 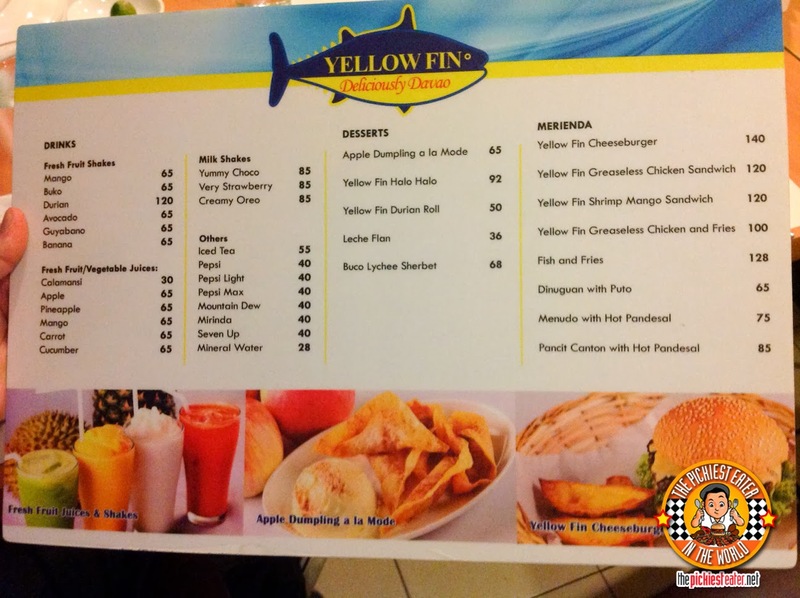 The beginnings of Yellow Fin restaurant is actually quite interesting. 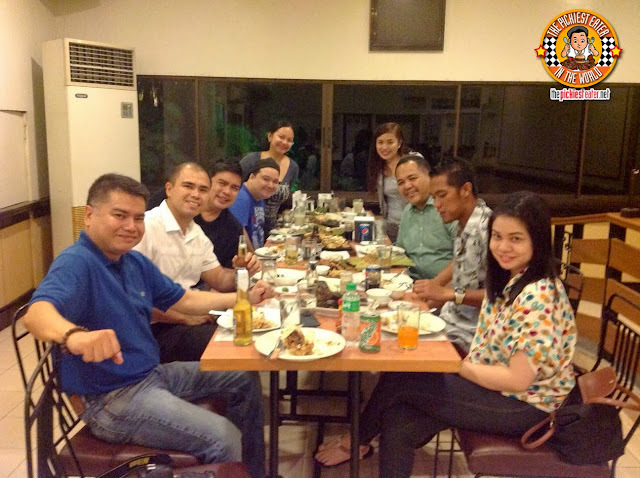 The Angeles Family owned a high end Steakhouse right across the street from where their Sandawa Plaza branch currently resides. Their customers ranged from Politicians, and other high powered businessmen. As they made the rounds, a common complaint by these VIP's would constantly come up - There was no place for their Bodyguards and drivers to eat while waiting for them. On that notion, the Angeles family toyed with the idea of putting up a "Karenderya" (as it was originally named) that could cater to the needs of their high profile clients, as well as serve the area that seemed to like low cost dining options. More than two decades later, that Steakhouse is long gone, but the Karenderya has morphed into one of the city's most popular seafood restaurants. 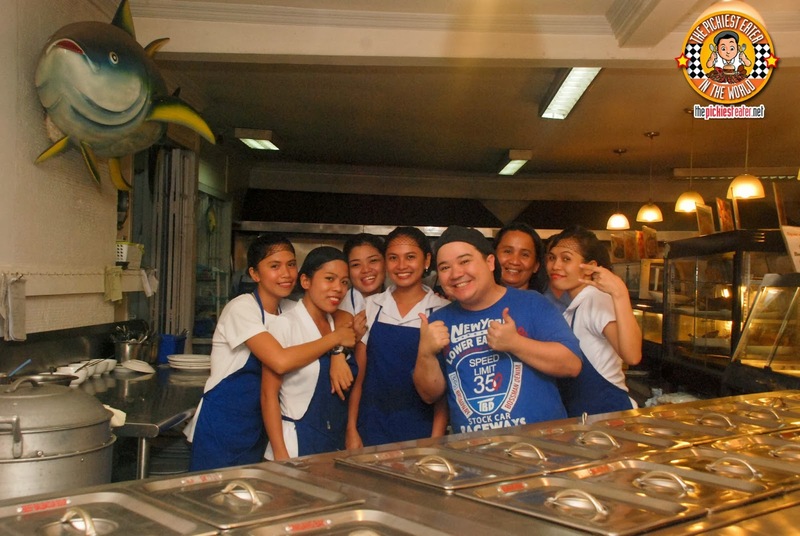 Soon, as the restaurant began to grow and grow, the "Karenderya" name was no longer appropriate, and was later replaced by Yellow Fin - named after the Tuna that has become the pride of Davao. 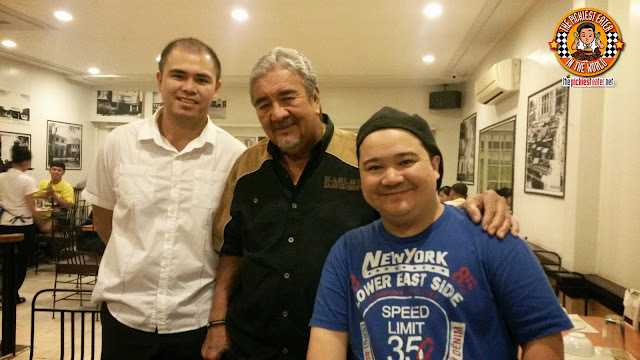 Despite its success, Yellow Fin still keeps with its original roots, with a cafeteria style dining are still operational- proof that the restaurant refuses to alienate their original clients that have helped catapault them to where they are today. 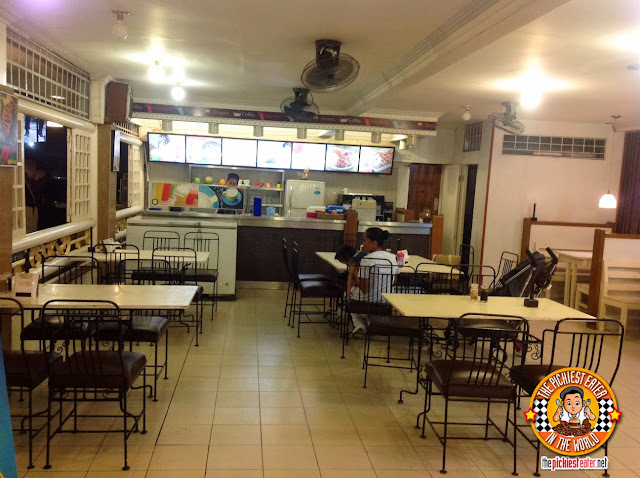 Over the years, Yellow Fin expanded their separate air-conditioned dining area for added comfort of their customers. 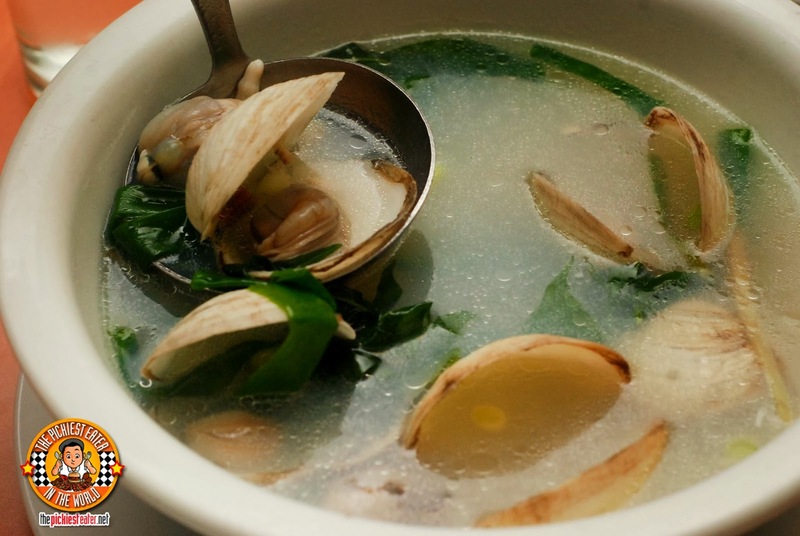 We started off our meal with Imbao (P125), some sort of a soup made with ginger and lemongrass, with some vegetables and clams thrown into the mix. Is it weird that I'm not fond of coconuts but I enjoy dishes with coconut milk, including Laing? That being said, Yellow Fin makes a pretty mean Tuna Laing (P45), with their gata sauce extremely addicting, and their Tuna meat a nice alternative to ground beef. Though Rina really enjoyed the soup, I was looking for some protein into my system. 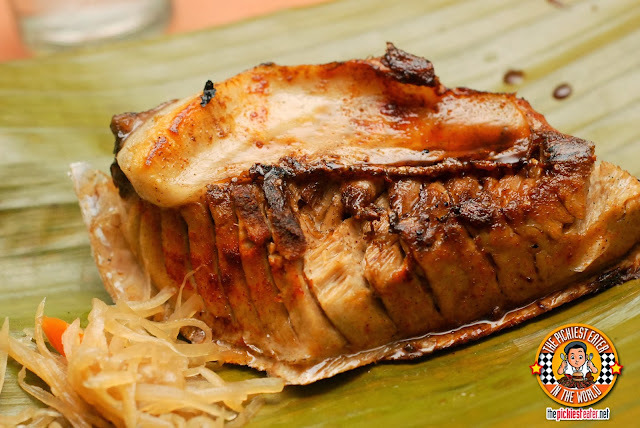 I was ecstatic when they brought out the Grilled Tuna Belly (P75/100 Grams "Ordinary" or P85/100 Grams "Big Eye), One of Yellow Fin's top sellers. Yellow Fin kept its flavors simple - simple seasonings of salt and Pepper, perhaps a bit of Calamansi and Toyo for a but more flair- but every component complimented the freshness of the Tuna perfectly. The tuna practically melted in my mouth. 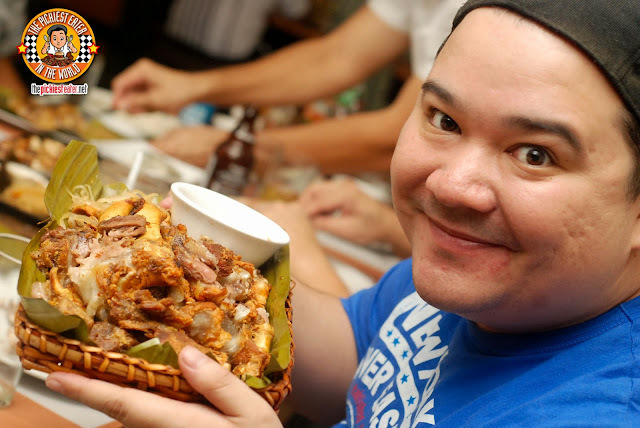 This was a dish that was definitively invoked the spirit of the City of Davao. 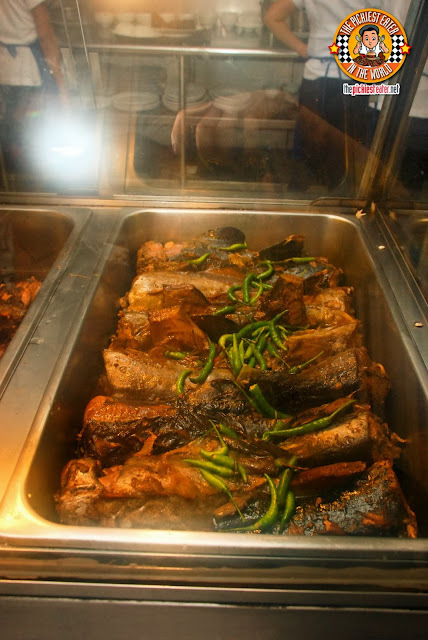 The Tuna dish that is most associated with Yellow Fin Restaurant, however, is the Adobong Tuna Buntot (P250/P300). This was phenomenal. First off, I didn't realize that the tuna tail had the fat content that it did, which to me, was a huge plus. 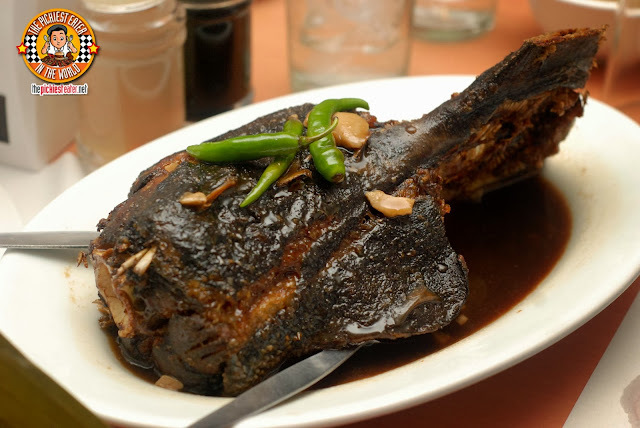 The tail was the perfect part to bathe in the sweet, yet salty adobo sauce. Just thinking about it makes me want to book a flight to Davao right now. 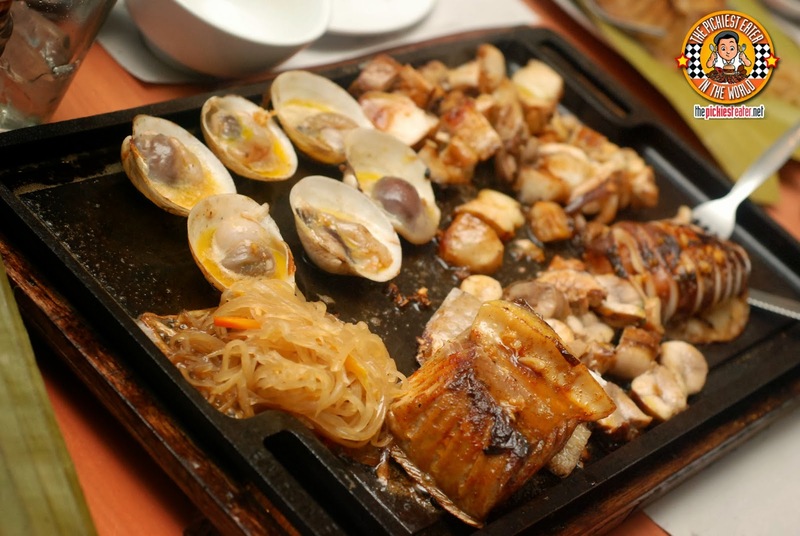 If you are a lover of Seafood, then I believe that Yellow Fin's Sizzling Seafood Platter (P680) would be right up your alley. The platter is filled with some Pinoy Seafood Classics, such as Tuna Belly, Pusit (Squid) and Shell fish, as well as some parts of the Tuna that I never thought people actually eat. I heard the words "Bagaybay" (Tuna Gonads.. WTF?) & Ubol-Ubol (Tendon) for the first time, and found out it's a very popular delicacy in Davao. I played my Pickiest Eater card and announced that stick to the Belly and the Buntot hehe. 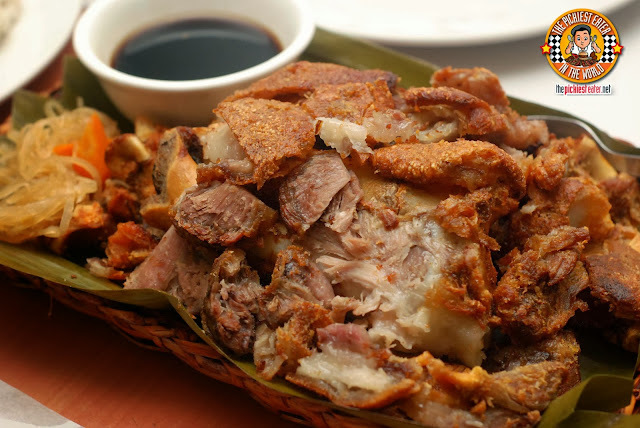 Showing that its more than just a seafood house, Yellow Fin also has an incredibly mouthwatering Crispy Pata (P355) on its Menu. The skin let out a loud crunch with my every bite, and the meat itself was juicy and packed with flavor. 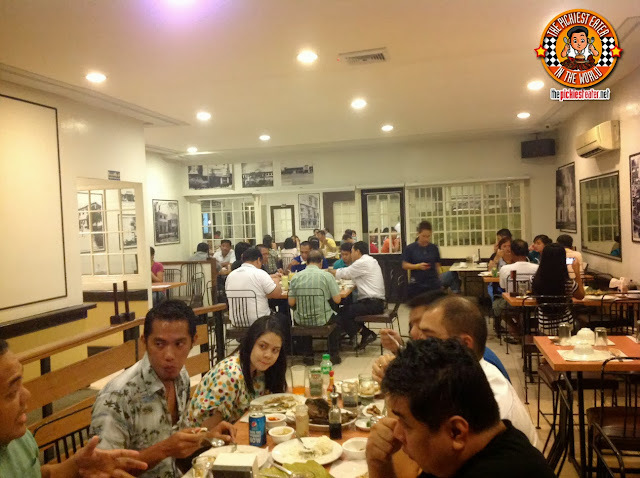 Though it is their Seafood dishes that helped Yellow Fin Restaurant become the name it is today, It is the Greaseless Fried Chicken that was an integral part in sustaining that legacy through the years. This is one of the best fried chicken dishes that I've ever tasted in my life. Yes, it was obviously deep fried, yet it lived true to its name.. 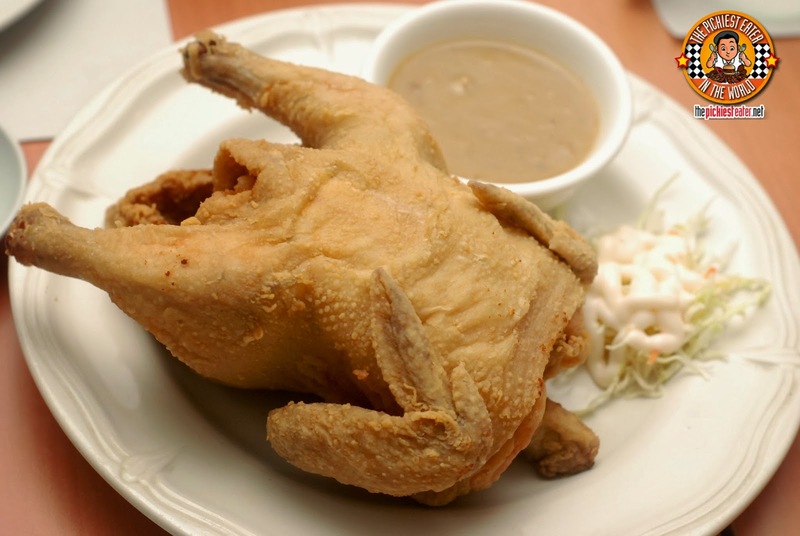 It didn't have the oiliness that other fried chicken dishes fall victim to. The chicken was amazingly moist, while the skin had a delicate crunch to it. The creamy gravy was also fantastic. For Dessert, Rina had the Halo Halo (P92). 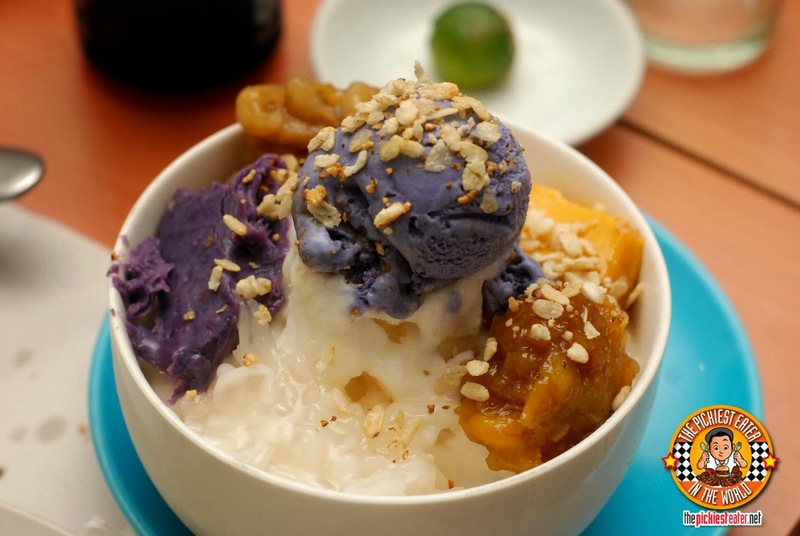 This was a good incarnation of Pinoy dessert favorite, with the leche flan particularly being the standout. I didn't think that the Durian Roll would work, but I was pleasantly surprised that I enjoyed it. 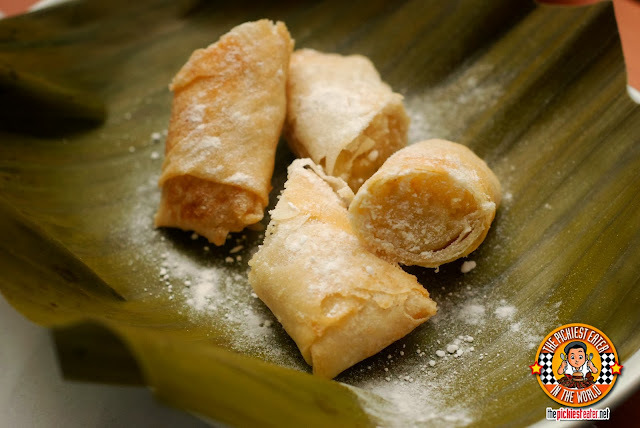 It's basically a turon with durian replacing the bananas. 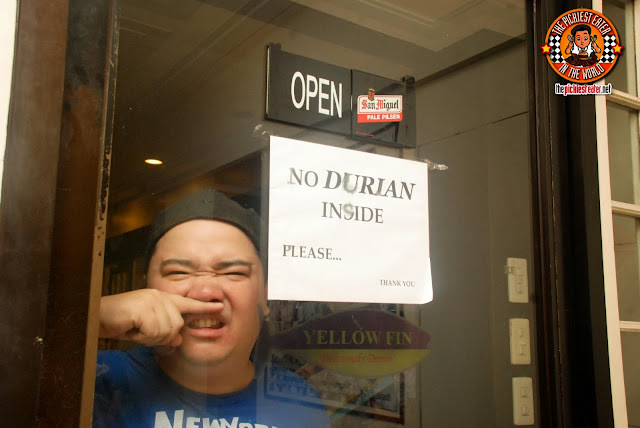 Fortunately for me, it didn't have the pungent taste that I normally associate with Durian. This would be even more perfect ala mode! owners of Yellow Fin Restaurant!